What do you get for the man who has everything and asks for nothing? You know how witty he thinks his boat name is - he is as proud of the boat's name as he is of the boat. But people only see the boat name when they're on the boat with him. But there is something you can do about that. 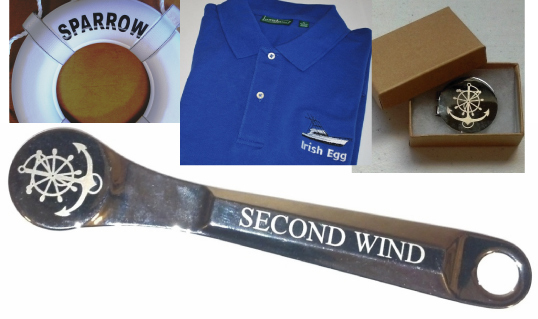 Get him a personalized t-shirt or captain polo shirt from Boat Name Gear. With his boat's name and hailing port elegantly embroidered on the left chest, your dad will be wearing a conversation piece and symbol of one of his favorite things - his boat. At Boat Name Gear, you can also get things like boat name bottle openers, blankets, jackets and life rings - all with the option to personalize them with a boat name or any text. Not sure about the size or color, or want to let Dad pick out his own stuff? No problem - just get him a Gift Certificate to Boat Name Gear where he can choose his own personalized products... and if it's a last minute gift, you can have it delivered instantly via email - to you or to right to him. The bottom line? Visit Boat Name Gear this Father's Day and take care of Dad with a unique and personalized gift that he'll love.